Giant Growth! Apply directly to the creature! Looks like the Seeds of Strength have come to harvest. Seems unimpressive for Standard, but Thud exists, so there's that. SO essentially 1 creature can get +9/+9 until end of turn if so desired. Does this interact with Beamsplitter mage???? 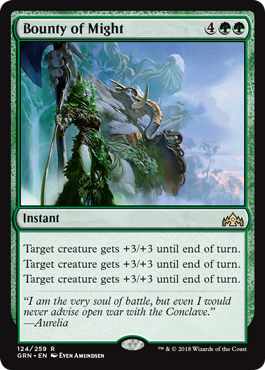 This is the first card that makes me want to play anything other than Dimir in the Prerelease.